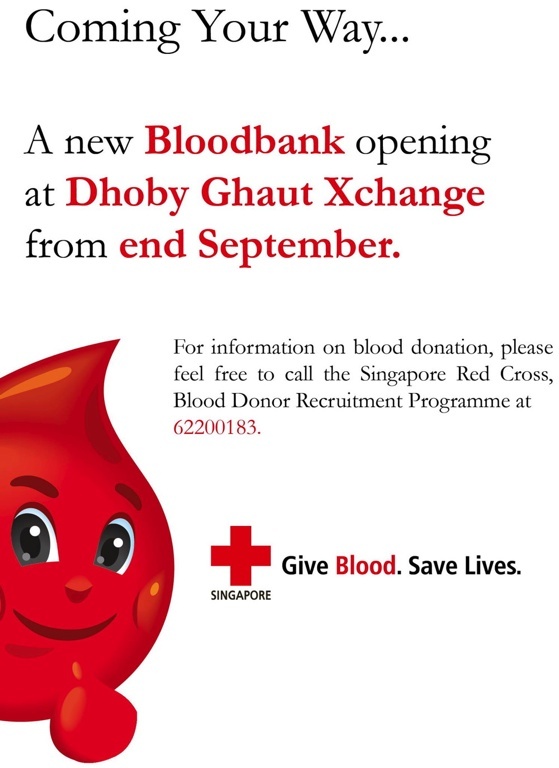 In September, a new blood donor centre at Dhoby Ghaut MRT! From September, you will be able to donate blood in Singapore City itself, at Dhoby Ghaut Xchange at Basement 1 of Dhoby Ghaut MRT Station. I just saw this announcement on the Singapore Red Cross Facebook page, after it was highlighted by Geraldine Yeo, the blood donation drive organiser at St. Andrew's Junior College. This new donor site will be helpful to large number of office workers and shoppers in the city. This is a more accessible location to donate blood, compared to the existing blood donor centres at Outram and Woodlands. The other potential catchment will be people working or living close to stations along the North South, North East and Circle lines near to the Dhoby Ghaut MRT station. will extend its operating hours on Saturdays and Sundays from 9am to 6pm. These measures will help address the periodic shortages of blood supply to hospitals during Ramadhan (from Jul – Aug this year), periods of heavy rains and during a surge in accidents or in dengue cases. For more information about blood donation in Singapore, visit the HSA and DonorWeb websites. « SAJC’s Blood Donation Drive today: Overcoming a fear of needles!